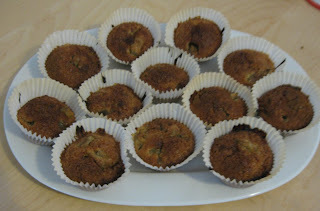 Kiwi Muffins! These are absolutely delicious even though I think I went wrong somewhere - they didn't expand as I'd expected them to and have stuck to the cases. They are SO yummy, though. Unfortunately I can't give the recipe as it's from a quite new book, but I will say you NEED to buy the Abel & Cole Cookbook. It is possibly the best recipe book I've ever had - I've cooked absolutely loads out of it and because it's arranged by season it fits beautifully with what's in our veg box. Although I should probably confess I was so keen to try these out that I didn't wait for them to be in season. Bad me. We also baked the Pumpkin bread yesterday for our first round of visitors and it was honestly to die for - even better as I was able to use fresh rosemary from the patch of concrete which is our garden.